Been a while since I wrote something on my blog. I am doing this blog as “work avoidance work”. WAW is what you do when you don’t want to do what you have to do (me: call comedy industry people and ask for gigs) so you do something else that is less productive but easier. It is easier cause it isn’t what you really should be doing. I am hoping through this post someone will see I am still alive and offer me work. For the past six or so months I have done bugger all but think about the destruction of Camberwell Old and New Cemeteries. Southwark Labour are cutting down acres of woods and digging up or mounding over 10,000s of graves. I write Southwark Labour because it is they who totally control this Borough by owning over half of the housing in the Borough and renting the flats to poor people who vote Labour. Southwark Labour is in the process of tearing down it’s public housing stock and selling the land to builders who are putting up expensive flats. Those flats that won’t be filled by Labour voters, I am sure of that. Southwark Labour are killing themselves. I should have been working rather than fighting Southwark. It will lead to no good for me. Mark my words. At the moment, Southwark is now preparing the ground on the side of beautiful and historic One Tree Hill for defoliation (all hills in Britain are “historic” anyway). I have been told that they started cutting “scrub” today. I should go have a look but too scared and what will it matter? Am I going to chain myself to a digger again? They have already cut down two plus acres in Camberwell Old Cemetery. That is the other cemetery. One Tree Hill is in Camberwell New Cemetery – two different bits of destruction with a common goal – to clear the land of trees and graves to sell it off for profit and voting gain. Immigrants to Southwark tend to want to be buried. I have learned the English political system isn’t like the American. When a British political party makes a decision, like Southwark Labour here, all the pols fall in line behind that decision,and stay with that decision no matter how boneheaded. What the party is doing is wrong on so many levels but they cannot stop. Parliamentary systems aren’t conducive to independent thinkers. That said, maybe every single Labour Councillor really doesn’t think they are doing the wrong thing? That is possible (see below re: a lot of Brits not caring about trees and heritage.). In America, as shown by this election, there are no political parties. Politicians rise and fall with their own political machine. I have also learned that the majority of British people around here care about these woods and the 150 year old gravestones as much as ISIS cares about Roman antiquities. And the ones that do care, most don’t have the energy to fight. Or are resigned. Americans still have some fight left. Okay, that is an exaggeration about the British but when I am one of hardest workers in a campaign, the campaign is fucked. That said, I have met some brilliant people who are fighting for beauty and history. And we fight on. Sign the petition here. 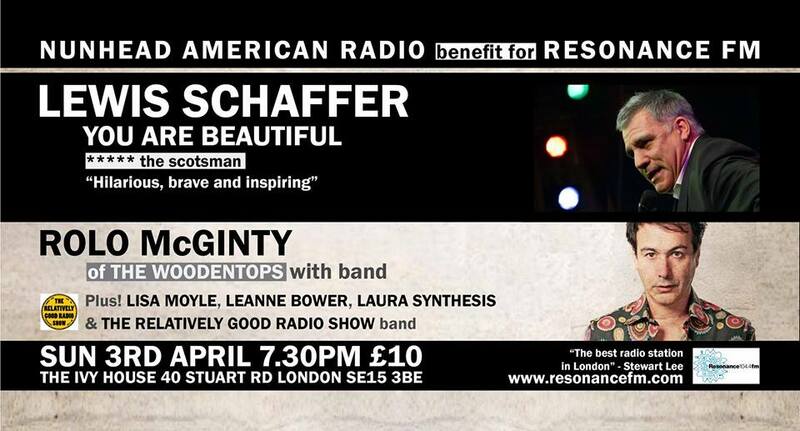 We (Nunhead American Radio with help from unstoppable Blanche Cameron) are putting on a fundraiser at the Ivy House for Resonance Radio 104.4FM on April 3rd, 2016 at the Ivy House in Nunhead Heights. I am repaying Resonance for giving me 30 minutes a week to squander on Nunhead American Radio. We are honoured to have the music of Rolo McGinty of the Woodentops with band. He is a full on and seminal rocker. I, Lewis Schaffer, will be doing my show five star show “You Are Beautiful. 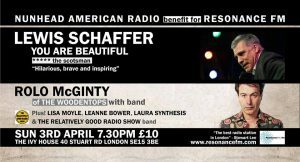 We are blessed to have Richard Guard and Anna Crockatt from the Radio Show playing the Nunhead American Radio music, Leanne Bower doing techy stuff, and the “funny one” Lisa Moyle. Plus, Laura Synthesis will make an appearance. If you haven’t listened to the radio show these people will mean nothing to you. Take it from me: It will be fun. As much fun as I can make it. Only 100 seats. Buy a ticket or two. 25th March 2016 Friday I will be doing a 20 or 30 minute spot on a barge in North London, location to TBD. This should be amazing fun as it organised by Richard Guard and Anna Crockatt of the Relatively Good Radio Show and on a boat.